I played the mod 'Warcraft IV Armageddon' and i discovered a nice idea with potential - the petrification tower. After a while I decided to make a small concept and a preview model. 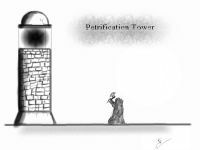 I love the idea of a magic tower that sends enemy troops into a prison out of stone. For us folks who like to stay Free and use the Blender 3d program over every other costly options! Mugen Fighting Competition has started. For more info and how to enter click the link.